‼️WARNING: This article contains graphic photos of the victim and video from the brutal attack on her. A group of four middle school students brutally beat another student, nearly murdering her in the process. The horrific event was captured fully on camera. 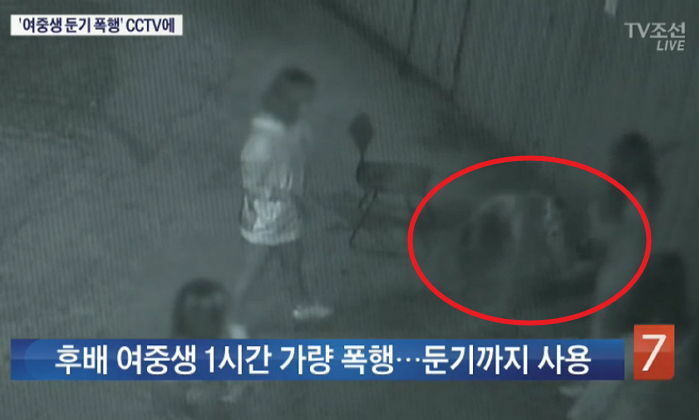 It shows the victim being beaten with a chair, a metal pipe, soju bottles and lit cigarettes. Three of the attackers are 14 years old, while one is still 13 years old. The victim is also 14 years old. They attacked her for 1 hour and 30 minutes straight and took photos of her bloody body. 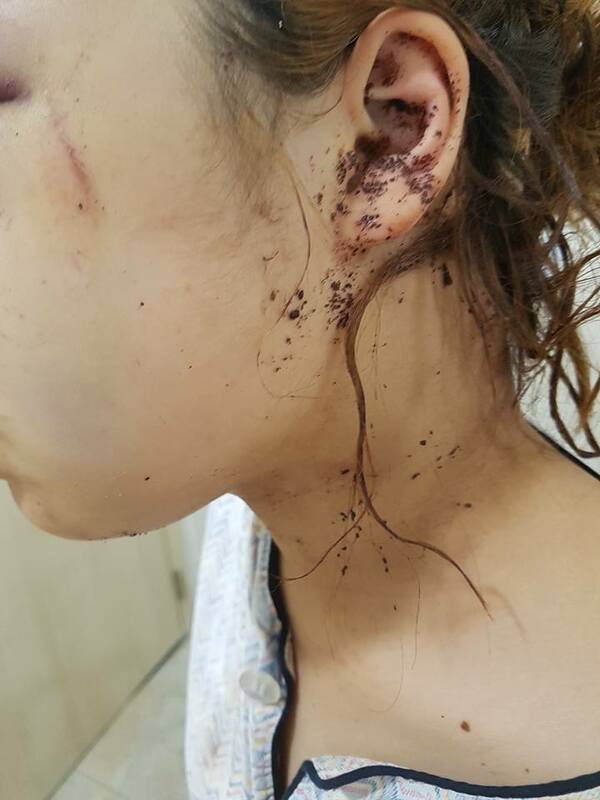 After the attack, one of the girls sent a photo to another student, bragging about what she had done. Student: What did you do? Attacker: I hit a kid. They say it’s attempted murder. Attacker: Is it too much? Student: Was it just you two? Student: Did you hit her alone? You’re a real psycho ㅋㅋ Did you both do it? Answer me. Answer me you b*tch. Are you really sending that to me and asking me if that’s too much? Wow. Until when are you going to keep doing that ㅋㅋ I’m getting really sick of you. You’ve already done enough, you should control yourself now. Attacker: Sorry. I’ll act properly now. The original text message between the attacker and another student, who was uninvolved in the attack. The unconscious victim lay beaten and bloody until discovered by a woman walking by. They called the police and she was immediately hospitalized. 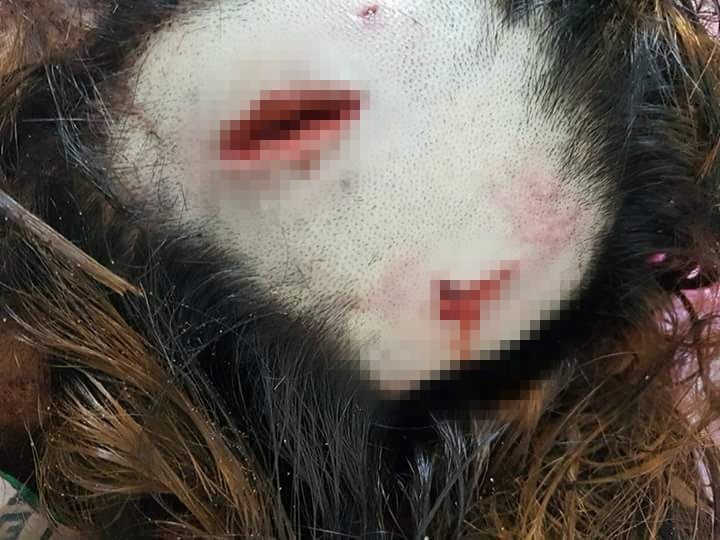 Hospital photos show extremely deep cuts that ripped her scalp open. 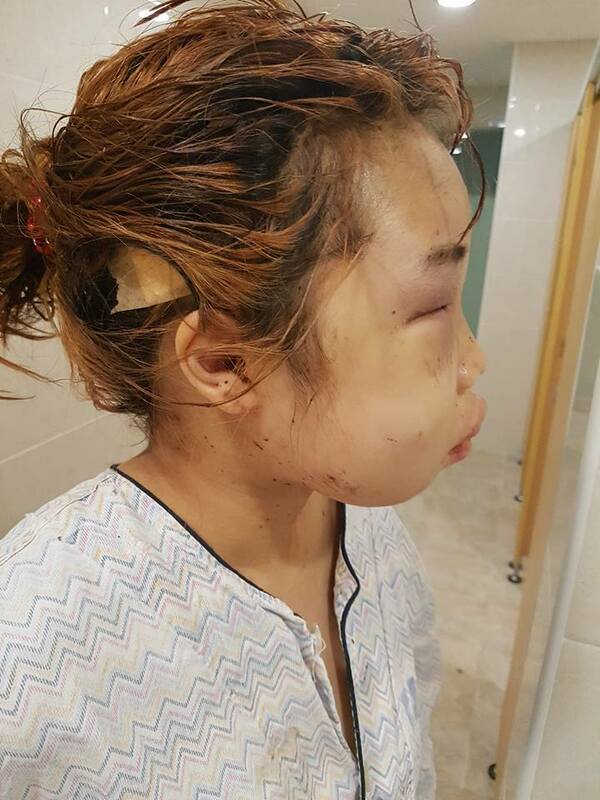 Her face was unrecognizable after the brutal attack. The attackers turned themselves into police, two hours after the initial attack. They confessed to the crime. The attackers justified their attack by telling police that they “didn’t like the victim’s attitude”. The victim’s mother made a statement on her Facebook and uploaded photos of her daughter, after the attack. It wasn’t the first time she was attacked. 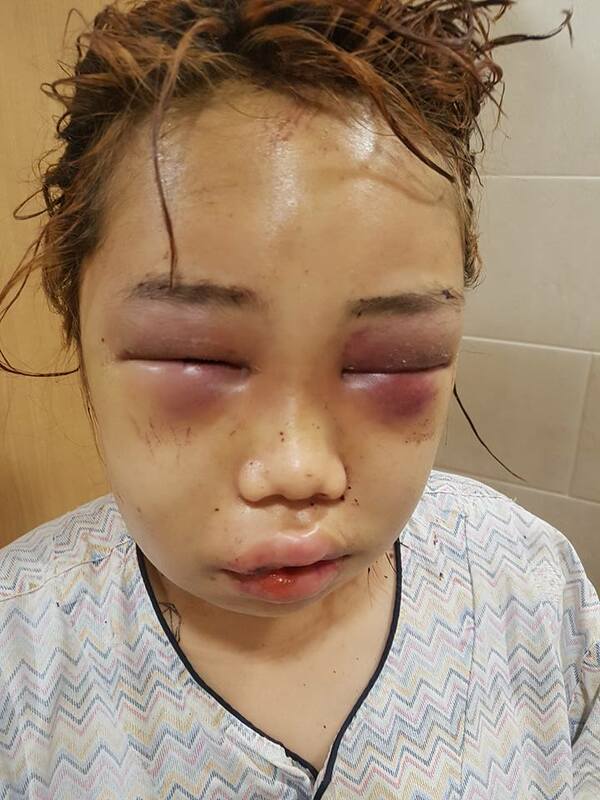 “My daughter was beaten up a second time and her face is now a mess. They say the reason was because they wanted revenge for the last time we reported them. Two months ago, a boy she knew contacted her. He was [one of the attacker’s] boyfriend. She was beaten up for picking up his call, and now she was beaten up for reporting the first attack. Her forehead is bloated like there’s silicon in it. I was going to dismiss the previous incident, being a parent myself, but I don’t think this is right. Reporters, please don’t write ridiculous things, I have a lot of evidence. I have an audio recording too, so don’t say she wasn’t injured too badly. My baby can’t even eat congee…. Korean netizens are flooding the mother’s post with support and expressing outrage at Busan police for how they handled the incident. Her entire face was bloated beyond recognition. Koreans have questioned why police did not step in sooner after the victim filed her first complaint. Dried blood on the victim’s ear after the attack. All four of the girls have been taken into custody for the horrific attack. However, the 13-year-old is protected under Juvenile Law and will not be detained, but can still face charges. ‼️WARNING: The video is very violent and disturbing.